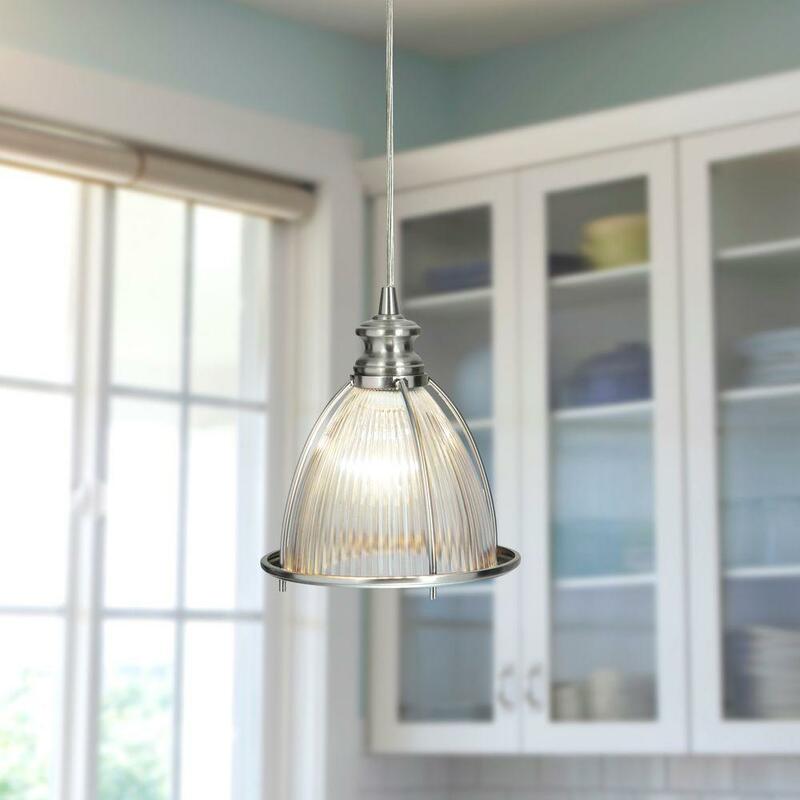 A Quick and Cheap Kitchen Upgrade - Easily replace recessed lighting with pendant lights! As I was looking at my kitchen, trying to decide what DIY project was I brave enough to tackle next, I decided to re-focus back on the kitchen. 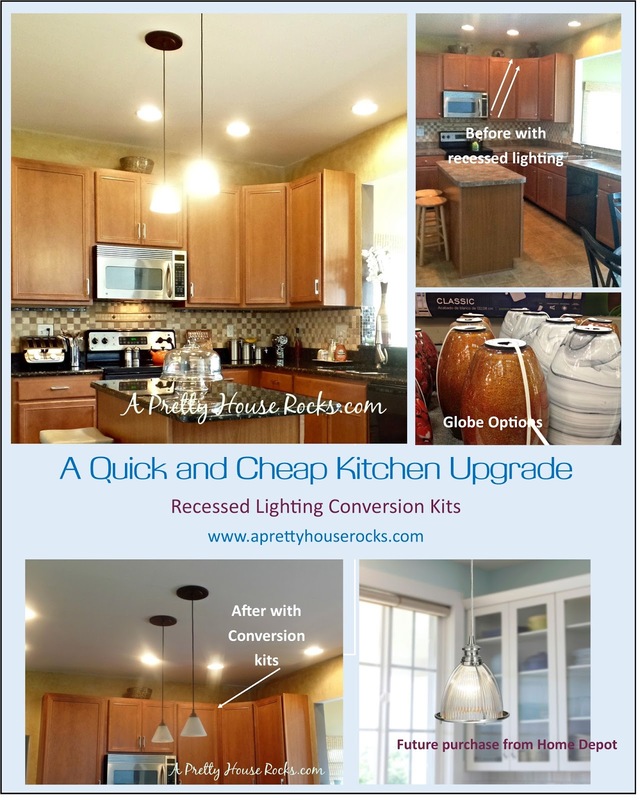 We decided to change the lighting, by using Recessed lighting conversion kits. A great alternative that is very cheap and easy to install. Honestly, these kits are really amazing and make it simple to replace recessed lighting with hanging pendant lights. Anyone can do it! When we had our home built we opted for all recessed lighting...what a mistake! In my opinion, hanging lights looked better and provided direct surface lighting. When I'm mixing at my island, I want to be able to see those lumps in my pancake batter. No one wants over-mixed pancakes! For those of us that don't really want to pay that electrician...this is a easy yet pretty fix. All you do is screw it into the recessed light. Many home DIY stores such as Home Depot and Lowes offer various styles and reasonable prices.......especially compared to what it would cost to have an electrician install them. I also love the versatility this option offers. I can change the style anytime I want...maybe purchase one in a nickle, like the pic below. I love this style and these only cost $45 each. A great change for any kitchen. 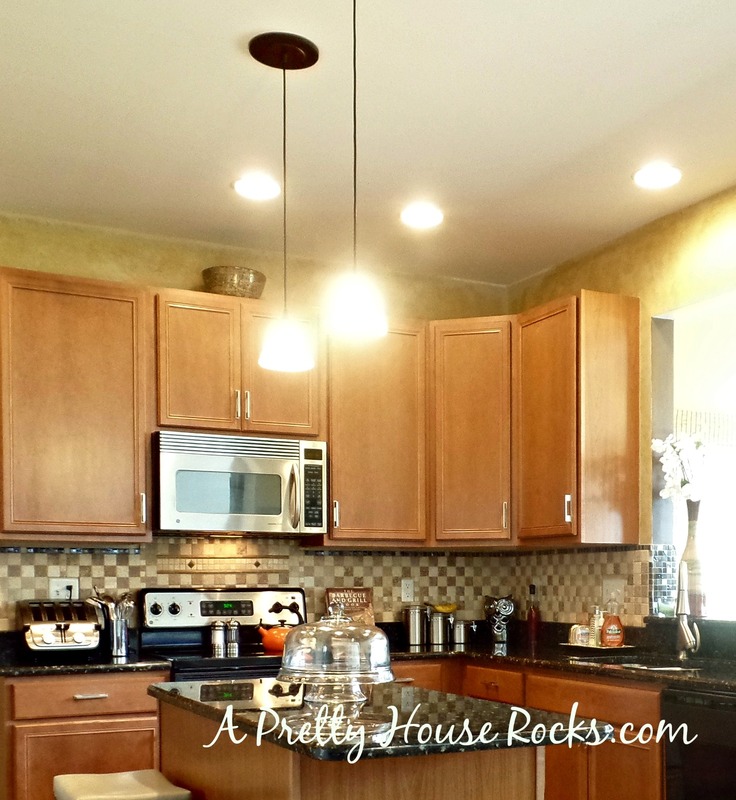 I can visualize these lights in my kitchen now! Very classy and expensive looking! Thanks for visiting A Pretty House Rocks! I hope these pics inspire you to do something pretty to your home!